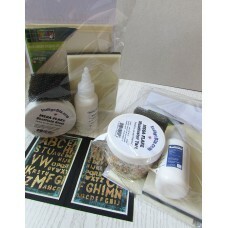 This is a super bundle of Gilding Flakes goodies which you're just going to love. The kit includes fulll instructions for using the flakes to get you started on creating some beautiful gilded cards. There's enough product in the kit to keep you going for a while yet and before you know it you'll be gilding everything which doesn't move! The kit contents include, a piece of foam pad, a scoochy foam pad, Flitter Glu from Indigoblu and the Mega Flakes from Indigoblu. All you need to get going is a stamp and something to stamp onto. The perfect kit for a card maker or papercrafter. A complete kit for making a Summer themed acrylic mini book with six transparent pages complete with..